Sorry, it's been a while that I didn't update the blog. I'm still adjusting myself, living everyday without acik. Life has been hard for me, seriously. One month after acik, my grandfather passed away. I lost both of them in just a month. They taught me, from knowing nothing until what I'm today. I'm so grateful I had them in my life. I hope, 2010 will be a better year for me, and the family...Insyaallah. My beloved Acik, Hasnah Kamaruddin telah pulang ke rahmatullah tepat jam 4.45 pagi, pada 18hb September 2009 bersamaan dgn 28 Ramadhan 1430. 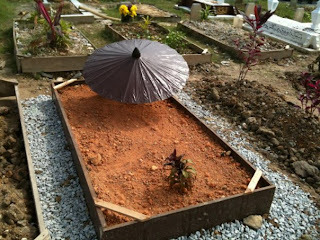 I was with arwah Acik till her last breath. Arwah pergi dengan tenang sekali. Alhamdulillah, Allah SWT telah makbulkan doa saya supaya permudahkan jalan untuk Acik. 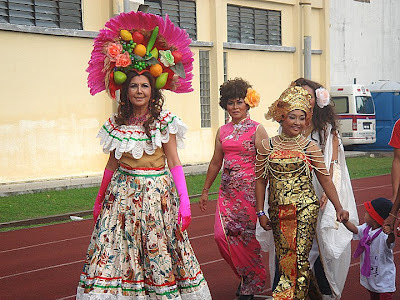 Semuanya seperti mimpi, rasanya sampai sekarang masih terasa Acik berada di sisi saya seperti yang biasa. Masih terbau lotion yang saya selalu sapukan pada Acik. Raya tahun ni sudah tiada makna untuk kami sekeluarga. Setiap tahun, Acik orang yg paling busy for raya's preparation. Acik akan busy buat kuih, kemaskan rumah dan siapkan duit raya utk semua anak2 saudaranya. Sekarang, Acik sudah tinggalkan kami semua. May Acik rests in peace there. I will always love you, Acik! I'm very lucky to get the chance to learn lots of things from you. Acik, you have a special place in my heart, and I'll never forget you. Semoga Acik ku tersayang di tempatkan di kalangan orang2 beriman. Amin. I don't know about you all but I feel these past few weeks there is nothing else that I hear, but cancer.... Cancer, cancer, cancer ...Arghhh! It's either A's sister is down with cancer, B's brother in law will have surgery in two weeks time to remove cancer, C will start his chemo next week, D just died bla bla bla. It seems this kinda news about cancer is endless. Everyday there'll be more news about it that makes me suffocate almost up to my nose with such news. I simply want to puke, well all that and plus my not so good condition body of course. This past few weeks my body seems to rebel against me. It's giving me undescribable aches and pains. Sometimes pain killers and masagging works, but when they don't that's when the tears start to fall. Nontheless when I went to see the neurosurgeons on the 7th of July they were happy to see me doing ok and one of them even said that I seem to have gained some weight. Haha.. little did he knew that I've played a trick on him like I always do to look more weighty. You see that day I went in wearing XL shirt and pants. That's why I looked so fluffed up. My actual size is just M.
It was there in the surgey clinic that I noticed several familiar faces. 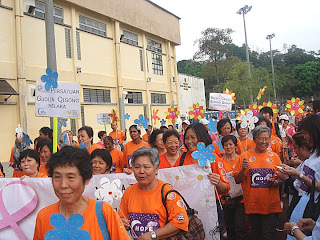 The were familiar to me because they were cancer patients whom I've seen when I wnt for radiotherapy treatment. They're in the surgey clinic meaning that they've also had surgery just like me and that could only mean one thing, that their cancer have also gotten worse also just like me. One or two were on wheel chair while others walk slowly. I guess they're fatigue or their body are so weak because of the illness. That's what I'm feeling right now. Then there was my appoinment with the oncologist. 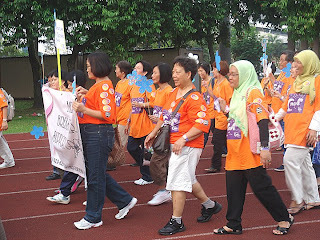 If before I saw many cancer patients up and beat, but this time I saw many of them are lethargic. Many were on wheelchairs. Because of my not so good condition I had to cancel my appoinments with the opthalmologist and radiologist respectively. With the opthalmologist, I requested a new apooinment date and was given the nearest possible date - Dec 2009 ! But luckily when I cancelled my simulation date for the brain scan on the 7th July I was given a new date two days later 9th July. The simulation eventho' it went well, was pretty agonizing for me. You see I had to lie on my back and that is something that I cannot do of late. To sleep I have to lie on my sides with pillows raised thus to have the simulation in that position is very painful for me. I was groaning thro'out the simulation and the radiographer noticed that. They're very kind to make the simulation as fast as they could to lessen my pains. With that my 5 sessions of whole brain radiation started on tha 20th July. I managed to make the first two but did come for my third trip. Why? Again I was not feeling well and my body aches all over. For the first two trips, the side effect sets in very fast. The moment I was in the car to go home, I vomited. It's been 3 weeks since my surgery and alhamdullillah, I'm still blessed by God the alMighty with time to spend with my loved ones. No doubt after the surgery I was feeling very tired. Tired of the highest order. No kidding. I could hardly keep my eyes open. I'd dozed off most of the day. I was just like a new born baby, waking up a few minutes then find myself dozing off again. This went on for more than a week, before I decided to try and do something about it. But with my legs still wobly, what can I do? I cannot go out for morning walk like I used to do before. Exercise with other elders at the playground is still a no no and swimming? Huh? I gotta be joking...I reckoned I'd fall asleep the moment my head touch water... Ohh how I miss all the activities that I used to do before ... Uwaaa....! Nonetheless despite all that, the doctors said that my recovery was good, considering that the operation was a major one for me. On the day of surgery E-ya told the surgeon that I have a history of waking up fast from the effects of aneasthethia so much so that the surgeon said that he will also administer me with extra sleeping pills so that I will not wake up quick enough to feel the pain from the cut on my head. But what happened instead? The surgery was over at around 2 am and I woke up early the next morning even with the extra sleeping pills.By noon I was already entertaining visitors in the ward. In fact I recalled receiving a lot of visitors that day and I was very excited seeing familiar faces of relatives and friends. But I think my visitors were more shock to see me. I had my head shaved at the back and the place where the incision was made was covered with plaster. When the plaster was removed, they can see all 40 big staples arranged in a U shape on the right hand side of my head, next to the ear. Me all skin and bones and now with U shape metal staples up on the head. It must have really been a sight. But before I was discharged I was given another CT scan and an appointment with the opthalmologist to check my eye. As I've mentioned before, after the surgey I'm having trouble with my eye sight. No it's not that I cannot focus or see things, it's just that I find my vision scope has narrowed a bit. I have trouble to see objects at the sides. I can see fine if the objects are in front but not at the sides. The first day I was at home, E-Ya was already shouting, "Acik! look out for the ...! But then too late...I already banged my head against the door as I couln't see it. Luckily nothing serious happened because of that. Even as I was typing this entry, I keep pressing the capslock key as I couldn't see it and I thoughtI was pressing the A or S key. Imagine all the mistakes I've made. Luckily dear E-Ya is around to do editing for me. Bless the girl. E-Ya told me when I was in the ICU , when I couldn't talk because there were tubes down my throat, I wrote notes to her but I mixed up the alphabets until she herslf does not know what I was trying to say. I mixed up the 's' 'b' 'd' 'a' and many others. Sometimes it's like as if I'm dyslexic. Other times I just mis spelt the words. But that was then. Now I don't have that problem anymore. Alhamdullillah. Another problem is that I have difficulty with adjusting distance of objects from me. Sometimes I think the object is there and try to grab it but then it's actually a little further or nearer from me . That's why earlier I said I'm experiencing optical illusions. I hope with time my vision canbe restored back to normal. Insya Allah. Because of this problem with my eye sight one funny thing happened when I was in the ICU. when I woke up the first question I asked my sister who waited on me was, "Sis are my eyes now squinted?" When she replied, "No", Boy that was a big relief! And then the day came when I had to remove the staples on my head. I had them removed on Monday, a week after surgery. At first I was so damn afraid just thinking about it. Actually while in the hospital I did not get the oppurtunity to see the condition of my head. When I asked E-Ya or my sisters how did my head look like, they all just say, "Oh its fine, nothing to worry...". Yeah right... But when I got home and got posession of my handphone, the first thing I did was took photo of my head and I gotta tell you I myself was appalled and afraid to see that it looked like that. I'd never imagine that it would even be like that... I have the photos for my own personal momentos, but for you all I think its enough if I say that it looked like what Mawi always says, "World!". It's too gory to show it here and for those who have photo sensitive syndrome or photo sensitive epilepsy, I don't want to be the person responsible for your fainting, or seizures. Hahaha... Serious folks. My own brother doesn't even dare to look at it longer than just a few seconds. My sister was afraid to clean the wound eventho its healingwell. And who is the person most undisturbed by all these? Who else but E-Ya. At first I had my cousin Rozaida, who is the doctor to clean it for me. E-Ya watched and after that the responsibility was hers. That was also the reason why I was afraid when the day came to remove the staples. I told E-Ya if the pain of removing the staples is excruciating, don't be surprised if I yell and grab the nurses by the neck. I reminded her to just be ready to restrain me from doing that. But alhamdullilah, even without anaethesia I did not feel pain when the nurse removed the staples. E-Ya was present when the staples was removed and she described to me how the nurses did it. She said the nurses used an apparatus to grab the staples and then yanked it out from the head. Ouch! But as I said no pain. Even if there was, it was just like ant bites only. The next day I was already shampooing my hair. Now the wound is completely dry and there is no pain at all. I do not also have any headaches. I really, really thank God the alMighty for making all these easy and painless for me. However looking thru the internet I found out that this memory loss is only temporary. and other side effects will also also include fatigue and hair loss. The doctor also said that I'll be zapped only 5 times and that there will be medications prescribed to me to control the side effects, so Insya Allah I'll be alright. But just in case, do pray for me too ya... Pray that I'll be able to tolerate all this and that my body will be able to withstand the procedure. As I am already fatigue right now and I don't know how much more fatigue I'll be. That 7th of July will also be my appointment date with the Neuro surgeons. But it will be in the morning. So I guess I'll be pretty busy next week. Previously I had appointments with only two units - gynae onco and onco. But after the surgery I have two more attachments with the opthalmologist and neuro surgeon. I guess now HUKM is like my second family already. OK I guess I'd better stop here before I fall asleep in front of this PC. I'll drop by again next time if I have the time and energy. Bubye! Salam to all. Alhamdullillah after giving my beloved family and friends a scare last sunday, I'm back here today updating my condition to all. Yes I did underwent a brain surgery last Sunday. I was told that I had a 4cm x 4cm tumor removed and blood clots cleared from my occipittal lobes.. in an operation that took about 5 hrs to complete.. This was totally unexpected. I never saw it coming at all, as there were no symptoms or signs at all. I only knew that I collapsed in my room that Sunday morning and was minutes later wheeled in an ambulance to the emergency unit of HUKM. And within several hrs after that I was already under the surgeons' knife. Everything was done in a jiffy. My family members hardly had any time to discuss the situation. They have to make the decision as to allow the operation to be done or not there and then itself. The gravity of the situation was such that if I do not go for surgery, I'd remain in the unconcious condition that I went in. If I opt for surgery, I might risk not waking up, meaning I'd be in comma or if I do, I'd be in a vegetative situation. How that for a choice, eh? The operation was a major one but I was one of the lucky ones that managed to survive it. I did not only survived it but was told by the doctors that I was out of life threathening situation and that in due time, I will be able to carryout my life somewhat 'near normal'.... Alhamdullillah. My gratutitude to Allah SWT and all well wishers who had prayed hard for me. Of course I have side effects of the operation. One of it involves my vision. It's still something not right. I seem to be experiencing some optical illussions and it's giving me headaches at times. Other than that I'm OK. I'm able to walk and fend for myself eventhough I need some assisstance to that. Well, can't complain too much. At least God is still giving me time to spend with my family. And oh Ya. I also have 40 'staples' up on my head now, courtesy of the operation. I have one thing good to say about all this though. I've always wanted to have Halle Berry's hairstyle as in the Catwoman, and because of this operation, now I do! Some even say I looked younger in my new Halle Berry hairstyle. Hahahahaha.. But then my bousterous nephews just say that I looked like that character in the telemovie "Sutun", Drat! FIY,i will also use all the time I have now to recuperate and try to regain most of my strength and energy back. I want to be able to carryout most of the things tht I used to do as quickly as possible. I do not want to be a burden to anyone. Regarding my cancer I did get some other new info about it but I do not want to go into details about it. This will also be the reason why you all will not see me updating frequently this humble blog of mine. Only If I had the time and urge to do so, I'll do it if not just rely on the saying that says "no news is good news". Ok bubbye for now and thank you again for kind support and prayers. Only God the alMighty can repay for whatever that you have done for me. Thank you. I'm E-Ya here. I'm writing to let all know that my beloved aunt is now fighting for her life in HUKM. On Sunday (June, 7th) at around 10am, I found my aunt lying on her bed and I was so surprised to see her condition. She can't move her body, and can't talk at all. She tried to say something to me, but I can't understand her. My first thought was she might had stroke. I became panicked when she couldn't respond to me and started to close her eyes. The only thing I could remember was to get an ambulance. My aunt was admitted immediately to the Emergency Unit, and since it was sunday, I had to wait for two hours and thirty minutes until an Oncologist came and examine my aunt. The Oncologist didn't take a long time to find the cause. He straight away explained that it was not stroke, but it's the BRAIN. Right after that, my aunt was sent for a brain scan. At around 5.15pm, a NeuroSergeon came to see my aunt and evaluated the result of the scan. As what they expected, they found a tumor (size approximately 4 by 4) and I was also told that they can see blood in the brain. Nothing else I asked to them except what can they do for my aunt. They wanted to do the brain surgery in order to remove the tumor and the blood. The surgery is to make my aunt wake up again. They explained to me and other family members about the risks. One of the surgeon showed to me there's a blood vessel which is very near to the tumor. I can see it clearly from the image on the computer. If the blood vessel is injured during the surgery, my aunt will not wake up anymore. It was a very tough decision to be made. Maybe the toughest in my life. I couldn't think of anything at that time, however my heart strongly says to proceed with the surgery. My mom signed the consent letter, and at 9pm my aunt was sent to the OT. The surgery will take 5 hours. From the bottom of my heart, I know she's strong. She promised to me that she will fight to matter what! To all my family members, my aunt's friends, Mr. Ice T and friends, thank you so much for your support and prayers. Hanya Allah SWT yg membalas budi baik kalian. 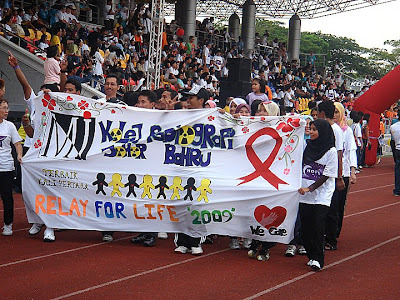 Alhamdullillah my plan to take part in the Relay 4 Life 2009 materialised eventho' I had slight cramps and back pains that day. E-Ya was initially against me going but I said nevermind lets just give it a try. After all this is my first experience joining such event and I want to see what's it all about. So the four of us, - 2 cousins, E-Ya and me set off after Asar, with my cousin Oji doing the driving. When we reached the stadium, parking was not a problem. We managed to get a parking space that's just about 50 meters from the entrance. Once in the stadium we did not immediately seated ourselves but went on to tour the stadium grounds to see what's available at the many booths set up by various groups and organizations. 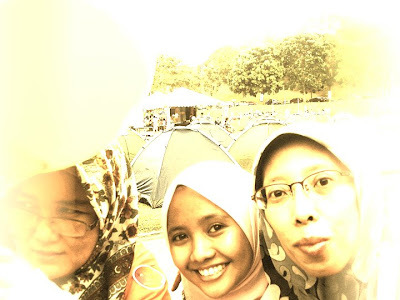 Then we took a short rest and after that my cousin Oji was already inspecting the food stalls while my other cousin, Intan was busy meeting up with her friends from one of the support group that she joins. Overall I would say the turn out was not as many as I expected, maybe because it was a 2 day event and I was a bit early reaching there. Nevertheless the ground of the stadium was already filled with tents to be used by survivors and and non-survivors who wish to stay the night at the stadium. At about 6 pm the emcee announced that the Survivor's Lap was about to start and all us survivors were asked to be on the track to start the walk. 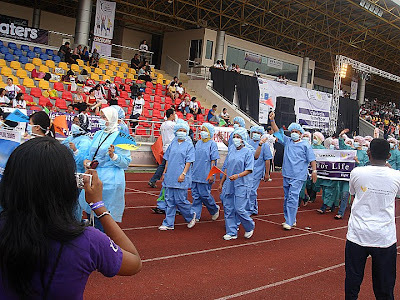 The purpose of the walk is a testimony to signify to the public that there are many people that can survive cancer. The situation was not like 10 or 15 years ago whereby whenever you hear a person down with cancer its practically a 'no hope' situation for him or her. Nowadays cancer patients have several options of treatment that they can go for and it is only them that can tell which is best for themselves. While we survivors were doing the lap around the track, non survivors who were standing at the sides of the field were encouraged to stick on to us a small encouragment sticker with the word 'Champion' printed on it. Well I had my fair share of stickers given by persons I don't even know who, and to them, my greatest thanks. I really hope that I stand up to the meaning of that word and one day be a champion in battling my cancer. Ameen. There was also the participation of people who have helped make this event a success. 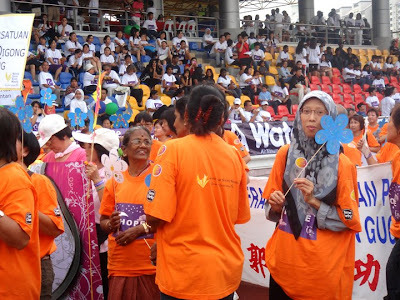 They comprises mainly of volunteers and donors from institute of higher learning and corporate sectors. 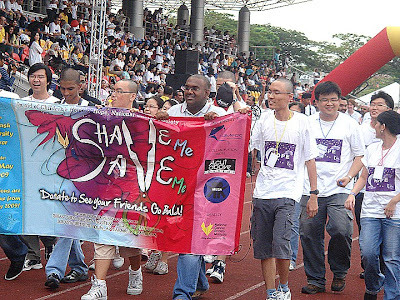 This particular group of guys purposely shaved their hair to show support to us survivors. Salute you guys! The two pics above... Survivors? Dunno ...,coz I did not hear the emcee's description of them. But they sure add color to the walk. 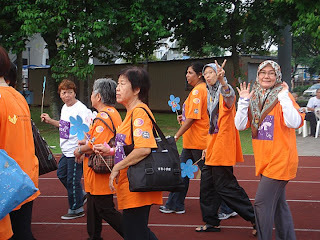 Tengah 'Lost in space...' mencari the endometrial Ca group yang rupa-rupanye mmng tak de ...Ishhh! 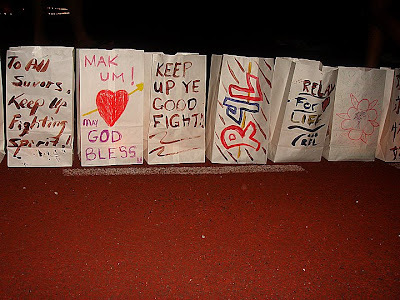 The highlight of the Relay 4 Life event was the Luminaria ceremony. 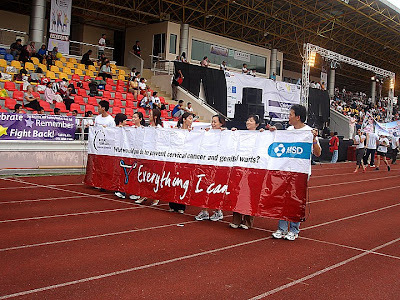 It is the most inspirational moment of the relay. After sunset, families, friends and survivors will light up candles in paper bags bearing the names of those who had fought cancer. Below are examples of some of the luminarias that I managed to snap before my camera's battery went kaput. No doubt that day I met a lot of survivors. Some have survived cancer more than 6 or seven years, but there are also some that are new, like me. In my eyes, they are all champions. They have shown that with high spirits and determination, cancer can be conquered. Perhaps the greatest champion of them all on that day is this 11 year old girl, Nurul Islah Mohd. 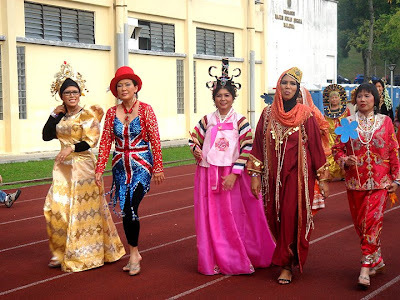 Shah who hails from Seremban. Much tears dropped that night when she read her journey fighting cancer. Islah was diagnosed with brain cancer and after undergoing surgery and treatment she is free from it. But with a very heavy price to pay. She now moves around with a walker as a tumour in her central nervous system affects her body’s balance and motor functions. The cancer treatment also leaves her facial expression unchanged. Despite all that, Nurul Islah is optimistic about getting well soon. I hope she does too. Ameen. Since the Relay 4 Life is a 2 day event, participants of the event are encouraged not to sleep that night to signify how cancer never "sleeps". But then... even if cancer never sleeps, I do. 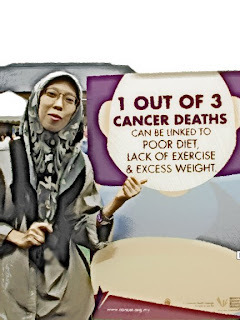 Cancer patient needs ample rest to build up strength and immune system to fight cancer cells, remember? So off we went back home at about 10 pm... tapi sebelum tu ... kita posing dulu ....! Ingat tu Cik Kiah ...!